The climate of Hobart, the capital of Tasmania, is oceanic, with mild, rainy winters and cool, quite rainy summers. Being that it's in the southern hemisphere, the seasons are of course reversed when compared to the northern hemisphere, so in July and August it is winter. 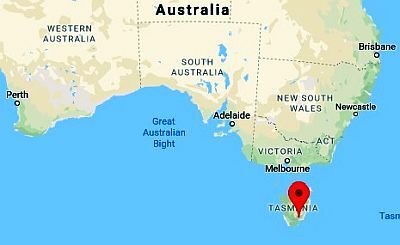 Tasmania is the southernmost state of Australia, and comprises the main island plus some smaller islands. At these latitudes (the island is located between 40 and 43 degrees south latitude), the western currents prevail throughout the year, with a series of disturbances that bring rainfall especially on the west side of the island. The wind blows frequently as well. 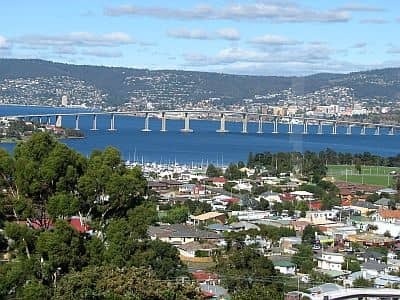 Hobart is located in the southeast, and receives 570 millimeters (22.5 inches) of rain per year, which is not much, but the rains are well distributed over the seasons (although summer is the least rainy season), and often occur in the form of frequent drizzle and brief showers. Here is the average precipitation. The average temperature in Hobart ranges from 8.5 °C (47.5 °F) in July to 17.5 °C (63.5 °F) in January and February. So, summer is cool, but winter is mild, although the wind can exacerbate the sensation of cold. Sometimes, especially in June and July, a cold air mass can reach the island, and in the hills and mountains of the interior, snow and frost can occur. In Hobart, in the coldest nights, the temperature can drop to around freezing (0 °C or 32 °F) or slightly below. Tasmania is not completely sheltered from the hot wind that can blow in summer from the Australian deserts, although this wind arrives here more rarely and with less evident effects. However, the temperature can sometimes approach or reach 38/40 °C (100/104 °F), although heat waves do not last long, and at night, the temperature becomes almost always acceptable again. The amount of sunshine in Hobart is not excellent because cloudy days can occur throughout the year, however, between one disturbance and another, the sun can come out: there is a maximum of 8 hours of sunshine per day in January (which is a fairly good value) and a minimum of 4 hours in June. The sea in Tasmania is cold all year round, however, it reaches 17 °C (63 °F) from January to March in the southern part (see Hobart), and 18 °C (64 °F) in the north of the island. The best times to visit Hobart are autumn and spring, in particular, the periods March-April and October-November. Between the two, you can opt for the former because the latter (October-November) is a bit cooler and rainier. Summer, from December to February, would be the best season, since the temperatures are higher, the days are longer and the rains rarer, but very hot days can sometimes occur. In these cases, however, owing to wind and low humidity, the heat is quite bearable. Considering that it can be a bit cold at night even in summer, when lows can drop below 10 °C (50 °F), it is advisable to bring a light jacket and a sweater even in this period. The Sydney-Hobart regatta takes place in summer, in December, while the Hobart Cup (horse race), takes place still in summer, but in February.